Volunteering is one of the phenomena which, despite the limited amount of volunteers, is seen as highly important for the appropriate functioning of society. Volunteering and active participation in volunteer movements are considered to be the key components of civil society; they generate social self-regulation and strengthen political democracy by developing active individual citizenship. Such issues have become topical in recent years. The studies stress the importance of voluntary civic engagement for the sustainable development and maintenance of civilized societal cohesion and democracy. The researches address volunteering as just one form of social and political involvement of the citizens connected with participation in voluntary organizations and individual involvement in public discourse. However, most studies on volunteering have been prepared in the tradition more specifically focused at helping behavior and unpaid work. Many articles, book chapters and reports have disclosed volunteering in various fields such as religious organizations, schools, human services, sports, etc. Although volunteering as a topic is far from being new, the studies – specifically placing volunteering in a civil society perspective – are rarer. The aim of this book is to precisely further explore this perspective, using theoretical and empirical data from various sources all over the globe. The contribution of this book deals with a broad range of issues concerning social influences, gender differences and attitudes towards volunteering. Some chapters give a general outline of the adolescents’ development, international volunteer movement and positive youth development; describe the relationship between volunteering and volunteer satisfaction; emphasize the need to strengthen the legal protection of volunteers and examine the predictors of prosocial behavior of youth; characterize employee and youth volunteering under the conditions of sustainable community development; examine more closely the conditions and problems of volunteering under specific circumstances. However, this book deals not only with the theoretical research of differences and similarities in volunteering in different societies and countries; other intriguing issues have also been examined, such as why people volunteer, how they relate to each other and to the beneficiaries, which ideas they wish to promote, etc. Qualitative and quantitative approaches to the research have produced better insight and deeper understanding of the volunteers’ goals and motives, attitudes and differences. Some of the chapters in this book present the empirical results of in-depth interviews, discussions and participant observation. 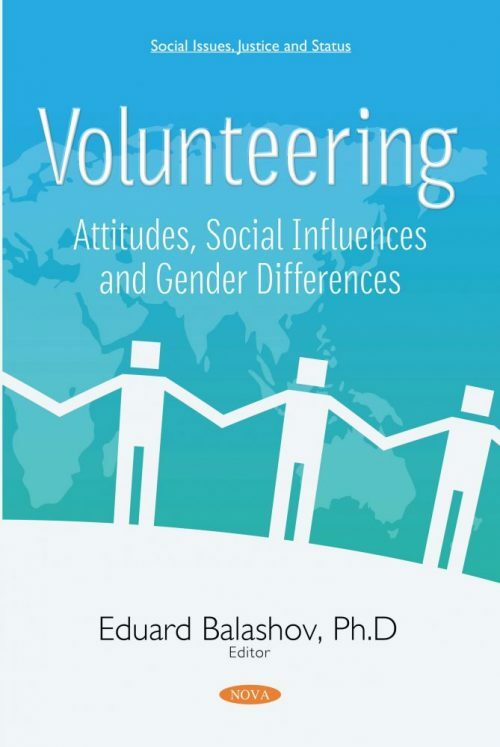 The editor hopes that his contribution in this book will advance our understanding of variety in volunteering; the differences between the attitudes and genders; the impact of the social and political environment on volunteering; and the influence of social settings and individual characteristics on motivation of volunteers. He also hopes that this book will contribute to the recognition of volunteering as an interesting and important topic for further scientific research. The editor wishes to thank all those who have contributed to the preparation of this book. As editor, he has invited scholars from different disciplines and countries to prepare their contributions, in order to get the broadest possible overview of the current status of knowledge in the sphere of volunteering. The editor believes that the resulting variation has been properly reflected in this book. He thanks all the authors not only for their contributions, but also for their accuracy during the preparation of the appropriate chapters.